Who doesn't love a Halloween party? At the ones I have been to or hosted, everybody is walking around with a perpetual smile on their face because it is so much fun seeing friends and relatives dressed up in zany costumes. 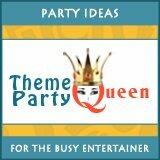 To help you plan your Halloween theme party, we show you how to make free Powerpoint invitations, we picked out our favorite cool costumes and Halloween decorations and we polled our friends and relatives to get their favorite recipes for Halloween. The Ghost in the Graveyard dessert is one of my family's favorites. Find all kinds of ideas here for homemade Halloween costumes, including quick and easy halloween costumes, some for couples, a few group ideas and several very funny costume choices. All inexpensive to put together. Here's where you'll find some really cool printable Halloween Party Games including "Pin the Head on the Monster" "Halloweeen Charades" and "Stephen King Trivia." on-line plus teach you how to make your own Microsoft Powerpoint free invitations. We found some of the best Halloween home decorations out there including scary decorations, inflatable decorations and even some lifesize animated Halloween decorations. Spiced Cranberry Apple Cobbler. Recipes for a Halloween party to remember!